Discussion in 'Tutorials & Resources' started by Logo, Nov 13, 2007. By request here's a tutorial on how to make Displacements Pipes and Sewers. I believe this is how it was done for 2Fort Sewers and it's how I did it in my map Jinxed. I'm going to show you how to do the most complex type (sewers you can go inside of and see from the outside) but you can adapt to your taste. Each number has a corresponding image attached. (1) Create your Starting Block. If you want to use the sewer cap model I recommend 240x240 (Length is up to you. Seen in the screen shot is 256x256 which is perfect for sewers that you will run through but can't see from the outside (like 2Fort) but a little large on the outside of the sewer cap model. The length of the block doesn't matter and you can change it later if it's too short or too long. (2) Hollow out the block you made. Again my recommended is 8 but you can play around with it to your liking. (3) Delete the two square sides of the block as show. (5) Create your displacement by selecting all of your brushes and going into the face edit/texture tool (can't look at exact name right now) and clicking "Create" under the displacement tab. (6) Now for each brush you have you must destroy all of the extra faces we don't need. In this case it's each of the skinny side faces. You can see them in the screenshot highlighted red. The way I tend to destroy them is by selecting the whole brush, going into the texture face edit tool clicking on the displacement tab then CTRL-Click the faces I want to KEEP and click destroy. This way I only need to select the 2 faces I want to keep. However you do it make sure that there are only 8 displacement faces left similar to (7). Keep in mind that faces are only visible from one angle so it's easy to miss faces you want to destroy! This is the trickiest part to do if you're new to displacements. (8) Now that we have our brushes setup properly you need to place a copy of the 4 brushes at each end as show in the screen shot. This will be important for the next step. All three copies of the hallowed tube should be lined up perfectly as seen. (9) Now the payoff. 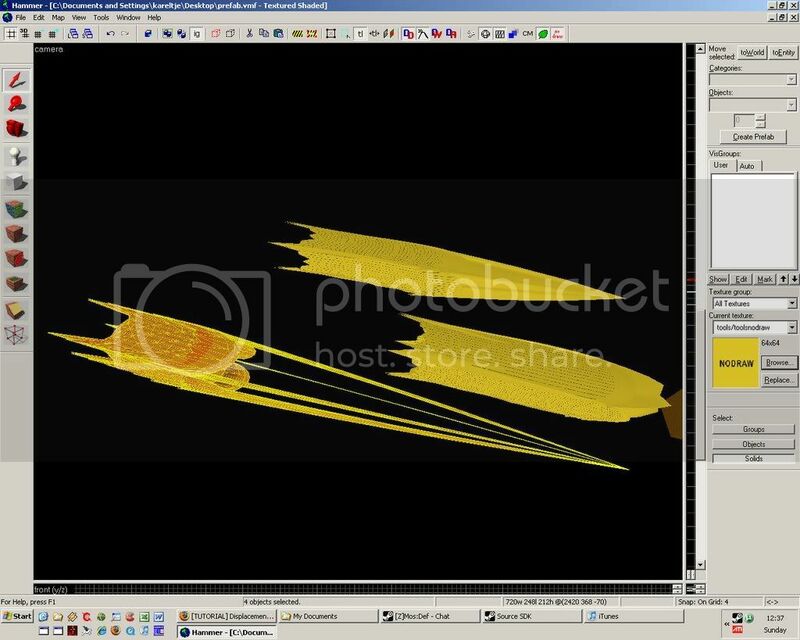 Select all of your brushes and go into the displacement tool and click subdivide. If everything went right you'll end up with what you see in the screenshot. This is why we make a row of 3 copies of the tube. The ends will buckle out when you subdivide so now to get a straight tube we simply delete the copies we made. (10) The tube textured and with a sewer cap places in front. Without something at the edges the sewer will look odd because of the faces we had to destroy previously. Now that you have it down what about the other two types of tubes? Tubes you can walk into but can't see from the outside (2Fort). To make Tubes/Sewers like these simply follow the same steps but delete all but the inner four faces of the displacement brushes in step 6. I recommend going with a 256x256 size for your block if you are making this type of tube. Tubes you can see from the outside but can't walk in. These are simple. Create the block as before but do not hollow it out. When you turn it into a displacement delete the square front/back faces (the ones we delete in step 3). Then follow steps 8 and 9. Enjoy and if you know how to make good looking corners or T junctions let me know! They're a little trickier. Oh wow. I can't begin to tell you how useful this is Rock on! Thank you so much! have you tried subtracting from the final brush yet? I need to do the same thing but I'd like to cut into it and am wondering how many leaks this is going to cause. Well you have 4 pieces to each tube section at the end. You can delete a quarter section (or 2 or 3) to make somewhat of a hole in the displacement but if it's a tube you can see from the inside and outside you'll have some issues with looking at it from certain angles. You can also use the clip tool to cut down on some of the displacement sides though your success may vary. I'd recommend playing around with the whole process trying different things and see how it goes. 2fort sewers are actually just regular brushes. Displacement pipes are better only if you want them to curve or bend. Sorry didn't mean to imply that the ones in 2fort were actually displacement brushes but that the sewers/pipes would resemble the ones in 2fort. With regular brushes you can do the same so long as you setup a smoothing group I think. I was getting those wavey ends so i played around with it a bit more and if you place 2 brushes, instead of one, at each end then delete them both at each end after you subdivide that should fix them. Edit: another tip, if your going to make tapered tubes (e.g. smokestacks) with this method, make sure you taper them before you create the displacements or you'll get a clover affect. Not sure if you can do this. Join together and sew, smooth out any bumps manually. Do not subdivide when they are joined or it will mess up badly. Also a slight variant on the original post, make 1 tube realllllllllly long, do the above and clip it down to size (equal amounts off each end). The longer the tube you make the more you clip off and the straighter the bit you are left with is. (10x longer than you need and it looks perfectly straight). Ok can be done, note these are quick 5min jobs so if you do a bit of manual smoothing around the corners it will look much better. Somebody mentioned T junctions, again a bit of smoothing would fix the errors. Just to show I am not cheating, heres the back. Hmm i guess i did something wrong, because i created SPACESHIPS! Picard to enterprise, Picard to enterpise! NVM got it finaly to work! One question. Why not to use arch brush for pipes? With that brush you can draw faster and easier any tipe of pipes or sewers. To make it curve, I followed the same steps but rather than put the three in a line, I turned it into a bend. I reused one of the sides by splitting it into two and using them to make the turn, or you could just start from scratch and make the turn step 1. I got lucky and subdivide produced something. You'll notice some discontinuities near the corner, but it's nothing that a little tweaking can't fix. thats my best option to offer. I think a better way to do this would be to make an arch at 360 degrees and make it a func_detail. Couldn't I just make a hollow cylinder? What would be the dis advantages of that? What are the differences between that and the tunnel shown in this tutorial?